U.S. Goals for NATO Summit Partially Met Membership for former Soviet states Ukraine and Georgia was put on hold for now, amid European allies' concerns of angering Russia. However, more troops were committed to Afghanistan, and the U.S.-backed proposal for a missile defense shield got a warm reception. Membership for former Soviet states Ukraine and Georgia was put on hold for now, amid European allies' concerns of angering Russia. However, more troops were committed to Afghanistan, and the U.S.-backed proposal for a missile defense shield got a warm reception. Today at the NATO Summit in Bucharest, membership issues dominated. Two countries - Albania and Croatia - were invited to join the alliance. Ukraine and Georgia were told they would get to join eventually, and Macedonia was told it will only be invited once it resolves the dispute with Greece over its name. NPR's Michele Kelemen is in Bucharest. MICHELE KELEMEN: It was a disappointing but not surprising day for Macedonia's delegation, which stormed out of the summit. Croatia and Albania, on the other hand, got a seat at the table, and Albania's Prime Minister Sali Berisha couldn't hide his enthusiasm. Prime Minister SALI BERISHA (Albania): For me, this is a miracle. This is a miracle of freedom. Thank you very much for this great trust and order. Thank you. Thanks to all of you. KELEMEN: They were meeting in a massive palace built by former Romanian Dictator Nicolae Ceausescu. And Berisha said it was a reminder of his own country filled with Cold War-era bunkers. President Bush smiled as Berisha spoke and used his brief remarks to remind NATO of its power to help countries transform and how much new members have to offer. Many have sent troops to U.S.-led wars in Afghanistan and Iraq. President GEORGE W. BUSH: These countries have brought new ideas, new enthusiasm and new vigor. NATO's embrace of these new members has made Europe stronger, safer and freer. These countries have made our alliance more relevant to the dangers we confront in the new century. KELEMEN: The president's hopes of putting Ukraine and Georgia on a formal track for membership today were dashed by Germany and others worried about upsetting relations with Russia. But White House officials say, at one point during the day, some of the newer NATO members surrounded Germany's chancellor, Angela Merkel, to hammer out a final communique that says the alliance does support eventual membership for those ex-Soviet states. Secretary of State Condoleezza Rice said this was evidence that Russia did not have an effect. Secretary CONDOLEEZZA RICE (U.S. Department of State): If there was an open door, I think there is a now wide open door. KELEMEN: On Afghanistan, White House officials said it's still too early to count up the number of new troops on offer, though it seems far short of the goals the U.S. had set. President Bush told NATO states that he'll move more American forces to the south to meet Canada's need for a partner in the fight against the Taliban. The U.S. is able to do that, thanks to a French troop offer from President Nicolas Sarkozy, who spoke through an interpreter. President NICOLAS SARKOZY (France): (Through translator) I announce the additional 700 French troops to be sent there in order to secure what we are already doing in Afghanistan, and which will enable us to reorganize and help rebuild this country. And I think this is a clear measure of France wishing to occupy its rightful place in NATO. KELEMEN: NATO members have also warmed up to the Bush administration's plans to put interceptor missiles in Poland and radar in the Czech Republic as part of a missile shield. In the communique, the alliance endorsed the plan, and National Security Adviser Stephen Hadley said the alliance recognized the protection this shield could offer, particularly from Iran, which the U.S. alleges is trying to develop missiles that could hit Europe. Mr. STEPHEN HADLEY (Adviser, National Security Council): There has been over 10 years of real debate as to whether there is a ballistic missile threat, and I think that debate ended today. KELEMEN: But it is a debate President Bush will still have to have with Russian President Vladimir Putin when they meet this weekend in Sochi. Putin is also to take part in what looks likely to be a contentious NATO-Russia Council meeting here in Romania tomorrow. 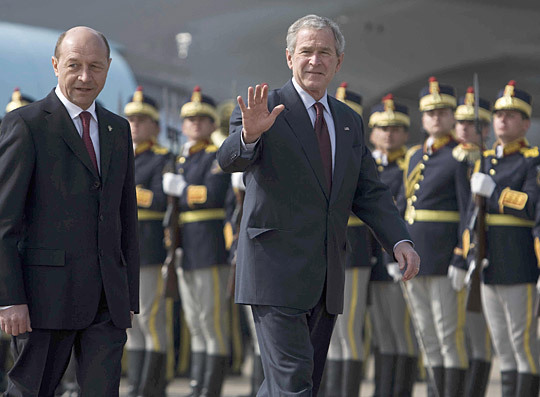 President George Bush (right) and Romanian President Traian Basescu take part in a welcoming ceremony at Mihail Kogalniceanu Airport in Constanta, Romania, on Wednesday. The current meeting of NATO leaders in Bucharest, Romania, offers President George Bush his last major chance to argue for one of his key foreign-policy objectives — continued expansion of the alliance's mission and its membership. Bush wanted a bigger commitment of troops and resources to NATO's operation in Afghanistan, and he wanted to bring more former Soviet-bloc nations into the organization — a move that Russian President Vladimir Putin has strongly opposed. Afghanistan: The United States, Canada, Britain and the Netherlands have called on their NATO partners to commit more fighting troops, especially to Afghanistan's southern provinces. That's where a resurgent Taliban has been more aggressive in the past year than at any time since the Islamic fundamentalist government was overthrown in 2001. 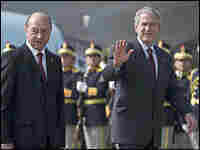 In comments leading up to the summit, Bush referred to expectations that France would add another 1,000 soldiers to the 1,500 it already has deployed to Afghanistan. Sarkozy said on Thursday that the number would be closer to 700, and it's still not clear how many troops other nations may offer. The United States currently has the largest number of foreign troops in Afghanistan — about 26,000. U.N. Secretary General Ban Ki-moon and Afghan President Hamid Karzai are attending the summit to push for better coordination of military operations and development efforts in the country. New NATO Members: The president failed to convince other NATO members that the former Soviet republics of Ukraine and Georgia should officially be put on track to join the alliance. But leaders at the summit did issue a statement welcoming the aspirations of the two former Soviet republics to join NATO and promising that they will eventually be members. France and Germany were among the allies who voiced doubts about whether Georgia and Ukraine were ready to begin the membership process. Russia opposes NATO membership for the two countries, fearing the expansion of a potentially hostile military alliance along its borders. The NATO alliance was formed after World War II in large part to contain the former Soviet Union. Russia is not a member, but Russian President Vladimir Putin is attending the summit as an observer. As expected, NATO did invite Croatia and Albania to join the 26 current members. Macedonia was also in line to join, but alliance members told the former Yugoslav Republic it must first resolve a dispute with Greece over its name. Missile Defense: Alliance members issued a communique saying they accept a controversial Bush administration plan to locate parts of an anti-missile defense system in central Europe. The plan calls for interceptor missiles to be deployed in Poland, with radar detector installations in the Czech Republic. President Bush says the system is designed to protect against missile attacks from countries such as Iran. Russia's President Putin opposes the plan, saying it would upset the strategic balance in the region by putting Russia at a military disadvantage.